Educators, business leaders, and community activists gathered in Grand Rapids for the Michigan Solutions Summit: An Educated Michigan. 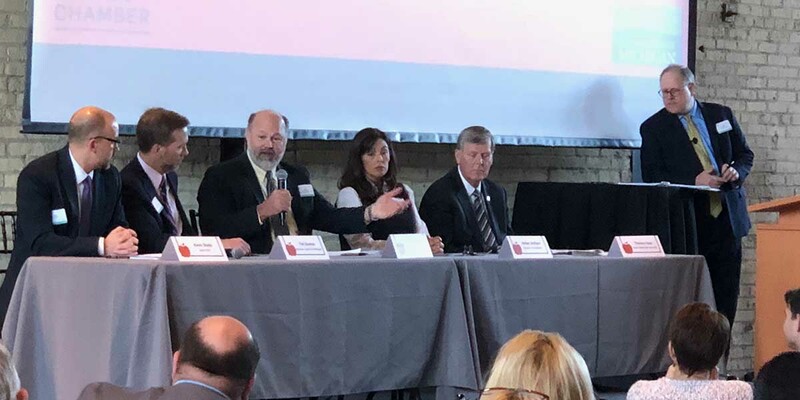 The panel pictured above featured Kevin Stotts, Talent 2025; Tim Sowton, Business Leaders for Michigan; Dave Campbell, Kalamazoo RESA; Amber Arellano, The Education Trust - Midwest; and Thomas Haas, Grand Valley State University President. Leaders in West Michigan have reached much the same conclusion as leaders in Southeast Michigan: The state’s public schools are in crisis. “There is a deep and fundamental crisis in this state,” said Mark Murray, vice chair of Meijer Inc., a former state treasurer, budget director and president of Grand Valley State University. “Less than half the kids in every grade in every subject in the state of Michigan are at basic proficiency,” Murray noted at a Grand Rapids Solutions Summit conference convened Friday by The Center for Michigan to examine possible reforms to the state’s troubled public schools system. He repeated that statement a second time, for effect. Co-hosted by the Grand Rapids Area Chamber of Commerce, the conference was the last in a series of policy conferences the Center and Bridge Magazine are hosting as a kickoff to the Center’s 2018 Michigan Truth Tour, intended to present Michigan voters with the factual background to make informed decisions about candidates running for state office in November. It followed a similar conference focusing on state education policy held in Detroit on Thursday. Michigan fourth graders ranked 28th in the nation reading in 2003 – but fell to 41st by 2015. Michigan fourth graders who were not in poverty fell from 24th in reading in 2003 to 48th in 2015. Documenting failure, conference speakers agreed, is the easy part. The bigger, more difficult, question: How to turn around Michigan’s public schools? Experts called for improved teacher accountability and support, an approach that helped Tennessee turn its K-12 system around. Over the past decade, Tennessee adopted a consistent, statewide teacher evaluation program, made major investments in a performance data collection system, and installed a rigorous program of teacher training. The result: Tennessee, far behind Michigan in 2003 in fourth-grade math, raced past Michigan by 2013, ranking 37th to Michigan's 42nd. It led the nation in highest improvement in several key subjects. Contrary to predictions that these measures would sow chaos among teachers, 81 percent of Tennessee educators report they feel appreciated under this system, with 88 percent saying they feel encouraged to participate in school leadership. Working in partnership with the Steelcase Foundation, Royal Oak-based Education Trust-Midwest opened the Center for Excellence in Teaching and Learning, to develop more effective teaching and school leadership in three West Michigan districts. Education Trust-Midwest reported that one Grand Rapids Public Schools elementary school, Sibley Elementary, ranked among the highest improving schools statewide in third-grade reading and math. In 2016, reading proficiency rates for low-income third graders at Sibley outpaced Kent Intermediate School District and statewide proficiency levels for low-income students. That bill, which would require an amendment to the state constitution, faces heavy obstacles, since it would require a two-thirds vote by legislators and approval by voters. Campbell does not want to see the state board abolished, but shares the sentiment of other critics who say the current system spreads accountability for the state’s troubled schools, meaning that no single entity ever takes responsibility or is held accountable for their failure. Campbell said Michigan would be better served if state board members were appointed, rather than the current system of being nominated at partisan party conventions – Michigan is the only state in the nation to do so. Campbell also argued that Michigan’s legislative term limits law, adopted in 1992, hampers the Legislature’s ability to adopt serious school reform. He favors its repeal, though that also would require voter approval. An eight-bill package passed Thursday in the state House would require instructors in the state’s schools of education to complete 30 hours of continuing education annually for the school to be certified as a teacher preparation program. It would also require education schools to offer a “warranty” to teachers who are determined to be ineffective teachers in their first two years of teaching. These struggling novice teachers would have to enroll in the warranty program to improve their skills, with the school paying for it. Other bills address how to improve the apprenticeship that future teachers typically undergo in school classrooms. The measures require schools of education to make a $1,000 stipend available to mentor teachers to help develop the skills of a student-teacher in their classroom, and would require student-teachers to complete at least 400 hours of classroom experience. I would guess nearly every new teacher in their first two years are going to be stuggling novices in getting used to the job. A "warrenty progam" seriously? These are people, not a car off the assembly line, this terminology sounds degrading. What methods are going to determine whether someone is struggling or not? We are never going to see substantive improvement until both education policy and education spending decisions are removed from the legislature. They are committed first to monetizing the system for the benefit of their contributors. Educated citizens are far down their priority list. We don't allow city councils or township boards to control local education, and there's no good reason to allow the legislature to continue to control state education--particularly given the bang-up job they've done for the last two decades. Most of the people I hear clamoring for the abolition of the state board of education in favor of gubernatorial power are people who hold executive positions--CEOs, executive directors, etc.. They LOVE the concept of a political strong man, even though it's a failure most of the time. The state BOE should be expanded, its members elected by district on a non-partisan ballot, and nominations by political parties prohibited. It should be a legislative body for education entirely separate, both policy and budget, from the state legislature. I totally agree. Politics in education never serves anyone well except those that have a specific agenda, ex. DeVos family. Those that spend the most to put their candidate in office, get what they want. Michigan is the poster child. BINGO!! You hit nail on head with this! Why would you have this summit in DeVos territory whose goal is to destroy public education? At least charters weren't one the list of their solutions! I listened to the conference on line. You should too. Engage schools with the community. Allow teachers to collaborate with one another. Focus on the learning needs of individual students. End inequality in facilities and support services. A "degree" is not the only outcome. And there is more. Decide for yourself, go to the second and third panel discussions and listen carefully. Then contact your legislator, www.legislature.mi.gov and share your conclusions. Attend a school board meeting and share your conclusions. Public education is the original term used by the Founders who knew that their republic would not survive unless the people knew and involved themselves in the issues in the public realm. They included morals and the philosophic issues of the time. Public schools (PS) piggybacked onto this honorable term to aggrandize their own project which is the training of individuals, much as we train soldiers, doctors (like myself) or dogs for that matter. The big movement in PS started in the 1870s, Michigan passed our law in 1871, NY, my home state in 1874. Before that, no "free," mandatory and universal schooling in the USA. There is a plaque at Fayette State Park in the UP from 1879 saying that 1/3 kids did not go to PS. The good citizens who were pretty smart didn’t think that PS were an advance of civilization and many would not subject their kids to the governmental training. I’ve often noted that the original PS in Kent County which are spaced at two mile intervals and were built at the intersection of the main roads all have the date 1891 on the door lintel. It’s probably the year that the Kent County commission caved in to state pressure. On the other side, were progressives like John Dewey who wanted to design the perfect society and who wrote at some length that PS were to re-train bright enterprising farm kids to become dull, uncomplaining factory workers. This was the era of manufacturing when designers and planners like Frederick Taylor (of scientific management) squawked loudest in the media. the term “Factory model School” has been applied. Children, like automobiles were to be moved down a line and stuff added to them at station one, station two, grade three, grade four etc. They still operate on the principle of loading our kids up with facts and use the amount of stuff added up, be it mathematics, English or Science, to judge their efficacy and efficiency. They never, ever look into how fit their work product is for living in a constitutional republic or in a moral universe. PS enforce PC, teach diversity and eschew judgmentalism. Everyone is great and gets participation awards. The PS must make everyone equal, right all societal injustices, even prevent the bright from progressing ahead of the dull. 2)There is good evidence that literacy was almost universal in the US as early as 1820. https://mises.org/library/free-education-and-literacy and https://fee.org/articles/education-in-colonial-america/ Think on it; what else did a famly have to do for entertainment after the grim workdays of 200 years ago except read, write, maybe make some humble house music. Read Laura Ingalls Wilder’s LIttlie House on the Prairie for information on the communal spelling bees that her father won. Compare literacy from 1820 to that of any large city in Michigan in which up to 50% of high school graduates are unable to read. 4)Folks who didn’t go to PS invented the telegraph, telephones, steam engines, built railroads and steel mills, wrote Shakespeare and the Declaration of Independence, developed the calculus and business empires. The guys who developed computers, plastics and automobiles stood on the shoulders of creative and unschooled giants. 6)The PS claim falsely, that lifetime earnings and presumably happiness increase in direct proportion to the amount of schooling that one has, Wrong! These “studies” are based on pure selection biases.. Kids who finish high school or college or grad schools are more disciplined, have better family structures, start off with more family money, are more motivated to succeed and above all, have higher IQs than do folks who don’t excel in the academic milieu. I could as easily claim that more schooling makes kids dumber and less successful in life than they would have been had they walked away from the PS and colleges; prove me wrong. 7)The use of “educational attainment” is racism; The employer advertises for a college grad for a job that pays moderately well after several weeks of training. He knows he will get a pleasant, tractile white woman and doesn’t have to deal with an aggressive abrasive black man who could as easily learn and do the job. 9)More money to improve PS is a fool’s errand. (Look up the Kansas City experience.) If you want to improve PS get better students. The output goes up directly with the input, not with the quantity of money that you can extract from the impoverished poor people who pay these taxes. I have no particular animus against PS but I present the above historical and observational observations to create a suspicion that maybe, the “needs” of the PS for more money and influence are overwrought, that we should be rethinking “more education” as the cure for every societal ill, and that there might be better ways to truly let the public “educate” themselves by letting them spend time with their families, with their religious and philosophical thinkers and with the cornucopia available on the internet. I would personally advocate for one room neighborhood schoolhouses until age 14 or so, that teach what the parents want their children to learn, to allow the brighter kids to test out instead of sitting through the repeated attempts to drill basics into the skulls of the dimmer, of encouraging enrollment in apprentice and work-experience programs at an early age, and of using the internet to let kids do whatever self education that they want-or need for their own purposes, not for that of the State of Michigan. I realize you certainly seem to think you are an education expert. You are a doctor of what?? Have you taught in today’s schools? Have you observed classrooms lately, or are you basing this on your prior experience??? Things are changing in education. To say that home schooling and Laura Ingalls Wilder provide models for a proper education tells me you have no currect vision of what public education is. Yes, Michigan schools aren’t doing well. The lesson from history show us that this downward trend started with republican Governor John Engler and continues to this day with republican Governor Rich Snyder. If there is a common denominator about his downward trend, it’s the vast majority of time, republicans have been in control of state government. Although Governor Jennifer Granholm was a democrat, all of the time she was in office, she had to battle a Michigan Senate that has been majority republican since 1983; that’s 35 years of total senate control by one political party. Elected republicans have just about completely politicized public education to the point of destroying public education as one pillar of our democracy. Our founding fathers were very supportive of public education. In his Thoughts on Government in 1776, President Adams stated that no expense should be spared: “Laws for the liberal education of youth, especially of the lower class of people, are so extremely wise and useful, that, to a humane and generous mind, no expense for this purpose would be thought extravagant." But starting with Engler, public schools have lost local control, as a result of Proposal A, passed in 1994 and in Engler’s 3 terms in office, unaccountable charter schools were created which currently steal $1 billion dollars annually from traditional public school budgets. Remember, charter schools were supposed to be created for innovation so that traditional public schools could learn from, allowing innovation in public education. This was an Engler ploy, since he needed some mechanism to destroy teacher unions and to get the rest of republicans to go along, he found a way to make money off the backs of school children, since about 80% of Michigan charters are run by for-profit charter school profiteers, where no accounting is made of how they spend taxpayer dollars. Along the way, republicans have painted those who work for public schools, particularly teachers, as the root of all evil and have de-valued the teaching profession, so few people going to college want to go into that profession. Most of what ails public education, lies at the feed of John Engler, since he was the godfather that started all of this, aided by DeVos and their ilk with their campaign millions. So, why isn’t Michigan’s trifecta of republican control doing anything to reverse this trend, they’re too busy gloating about their accomplishments, since they chose long ago that if children were collateral damage in their war against public education, it was the price they were willing to pay. It figures that you left out the important issue of equity in school funding that was not only a major point but the very first point raised in yesterday's Summit. I was quite clear that I favor a strong and independent State Board of Education (SBE). Independent from the Governor as we are a purple state and education should not get whip sawed every four to eight years. The SBE also needs to be independent from the party conventions to make it much less political and more focused on developing good policy that would produce much better results for children. I asked participants in the Summit to support Rep. Kelly's efforts to work with Democrats to develop a compromise that would create a strong and independent body that could lead public education much more effectively than our term-limited legislature has been doing. Your goal is laudable, but I'm having a hard time envisioning Republicans and Democrats working together (or separately, for that matter) and creating a strong, independent body to lead anything, let alone a system with billions of dollars to manipulate. Power is never ceded--it has to be taken. I'll never believe we can have a body independent from the governor and legislature as long as people think political parties and their progeny should be trusted to create it. As a teacher of 22 years I have never felt more under-appreciated and targeted with hated by members of the public and government. Republican autocrats have slowly chipped away at the basic infrastructure of public education by dismantling programs, slicing budgets, pushing more under-performing charter schools everywhere, and spreading their dislike of education in general. Democrats are not much better, but have a softer standard are are willing to listen carefully without talking back. Yet, we have slashed pay for teachers both in salary and benefits. Thus, when my eldest graduated with teaching degree I begged her to search outside the state as this state no longer values education. She settled in Vermont and loves everything about it - the salary, the community involvement, the natural environment, and the reciprocity from the students and children. Michigan, just like the rest of the country, is too divided over basic ideas and philosophy of a citified life. So, even though my pension is wrapped up in this system, I vote for dismantling the entire public educational system and replacing it with something that will treat teachers with the respect they deserve. The only stipulation is that the school administration should take marching orders from the teachers, not the other way around. “Less than half the kids in every grade in every subject in the state of Michigan are at basic proficiency,” said Mark Murray, vice chair of Meijer Inc., a former state treasurer, budget director and president of Grand Valley State University. Struggling teachers, struggling students, and struggling 'education schools' do not seem to be able to recognize when a child has become 'unable to learn'. I would add, looking forwards in terms of solutions, "Every teacher, in every subject, must demonstrate: the ability to detect when a child has become unable to learn." "Every teacher, must demonstrate the ability to return 'the ability to learn' to any child in their care." "Every teacher, must demonstrate, the ability to sustain 'the ability to learn' in any child , in their care, throughout the school year." Every student must pass at 'grade level' by the end of the school year, or the teacher, has to hire a tutor to do this, before the beginning of the next school year. The school must retrain any teacher who can NOT to do this, or hire a tutor to do this retraining. The educational school must have their educators RETRAINED to meet this standard, or hire a tutor to do this retraining. Then they must RETRAIN any of their teacher graduates that fail to meet this standard, or hire a tutor to do this. The Bridge contributor currently identified as "***" asks, "What methods are going to determine whether someone is struggling or not?" Here is my answer to that. It is not a substitute for each reader learning how to do this themselves. When one person communicates to another, they have an idea, an understanding, the idea goes from them to another person. The other person then understands the idea. When this is done with words, the words must be understood, or communication does not occur. When a student reads he takes the written word from the page, understands it, then applies it. If this does not happen, he is unable to learn. All one needs to do to return a student's understanding, and 'the ability to learn' in any subject, is to find the first word they did not get in that subject, then get it properly defined so they do understand, so they do get, that specific word. When this is done the student looks "bright", "enthusiastic", "full of understanding", "full of the willingness to learn that subject". They have "the ability to apply", what they understand. They can "do the actions" they have learned. They are "certain". When a student does not look like that, they have already become "unable to learn". People can learn to see when a child does not have the ability to learn. People can ask the child, "What does this word mean? If the child can not say quickly you have him look it up. Now the child that reads out loud at 250 words per minute has to know the words pretty well to understand them, and comprehend the material, when moving that fast. So you look to see if they do understand the meaning of the word that fast, when you ask them what the word means. If they hesitate, don't know or anything else, then they should look it up and learn it a little better. Despite the complexity of the problems in Michigan for 1.6 million students, and the tens of billions of dollars spent every year, the solution is not complex at all. For a student to get the idea of another when it is expressed in words, they have to learn to understand the words. (or this will NOT happen.) Nearly every word is fully defined in ANY good dictionary. Words may be defined in textbooks. The student has to know how to use a dictionary. He has to know how to see when someone becomes unable to learn (himself or herself for instance). The first thing that happens when the student goes past a word that is NOT understood is that they go blank. Their understanding of the subject goes blank. Their ability to apply goes blank. If you are looking at them they look blank. If you are having them read out loud, they will also have a physical reaction right at that exact instant, instant in the material, that you can see, where you can detect something, and then stop to find the exact word that was not understood. They might substitute another word, hesitate, clench a fist, sigh, or show any other sign of discomfort or stress. They should be reading comfortably without stress. You stop right there and ask, "Is there any word there (you might point to the location on the page) you do not understand?" I did this with one young man, 3 months before his high school graduation and we found 80 words right there on that page that had only 200 words on it. He then could read that page comfortably. You find the word. You get the student to understand it. He can now read smoothly, quickly and easily, comfortably with NO stress. He fully understands. So does he look "bright," "enthusiastic," and all that? If not, find another word, till he does. A student can retain the ability to learn through out the school year and learn the subject to grade level, or much faster. When my son learned to read this way, he could increase two grade levels in reading, per year with no help from parents, his teachers, from tutors, all by himself. Students need to know how learn. Teachers need to know how to help the student achieve this. Educators at educational schools need to know how to help teacher's to do this. I think we need to head off policy makers, educational schools, school boards, teachers, unions, students, parents, newspapers, TV reporters from doing anything else. This needs to be done. Mentor teachers would help because the first 2 years of teaching are the most difficult. A Board of Education controlled by the governor would be no better. We need to take the politics out of education. We need to assess students based on multiple measures not just standardized tests, while raising the standards. We need to eliminate Credit Recovery because students are passing a year of classes in 2 weeks. It is a scam to make it look like graduation rates are going up. Tennessee is still 37, not so great seems to me. We are making a huge mistake if we hold back 3rd graders because of a reading score based on a standardized test and without a plan on how to improve reading (notice I didn't say reading scores). We can improve reading scores and at the same time insure those better readers do not read at all in the future because they hate reading. Is that progress? While all of this is part of the problem, remember that education funding was gutted by Snyder’s admin and our state test is not a normed test but something the state came up with rather than a standardized test that provides reliable data. How about we let teacher’s teach and kids be students and learn?? Make sure all kids/public schools have same level of funding and make sure there is music/art/physical education in all schools. And mostly get rid of these ridiculous arbitrary standardized assessment that have kids starting to hate school in kindergarten! All these tests are, are MEGA profit makers for private companies that own them.